Hello there lovelies! It’s Shay here. This is a particularly difficult post to write as change is never easy. If you missed Julie’s blog post on Sunday please CLICK HERE. Julie, co-founder + co-owner and all-round awesome designer, is stepping down from being an owner of w&w at the end of this year. 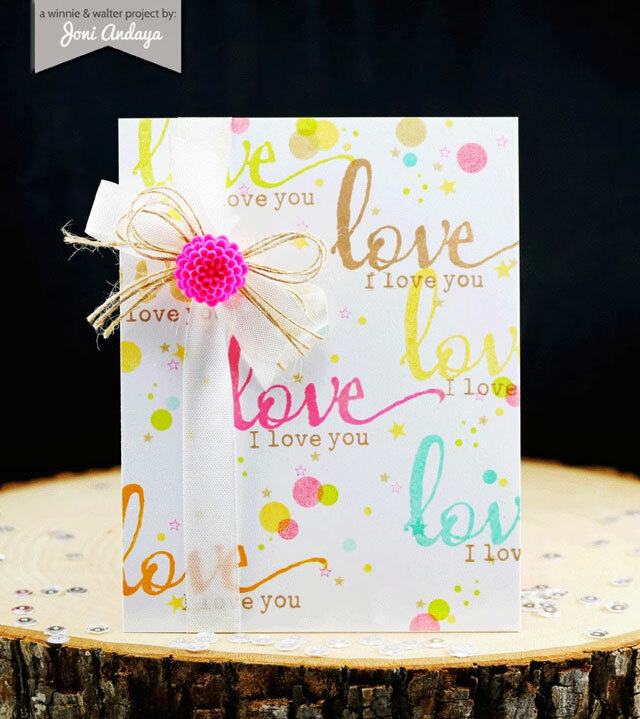 It has been such an amazing journey from just talking into the wee hours of what we could do to running a company that produces collections that include stamps, dies and stencils. I feel fortunate that Julie was beside me as we found the courage together to reach for, fulfill and even surpass our dreams. I will always treasure all that I have experienced with and learned from Julie and her tremendous talent, attention to detail, patience, sweetness and friendship. Although I am mightily sad to not have Julie as my business partner, as her friend I am so grateful she is going to take some time to just concentrate on Julie. Julie, like many women, don’t put themselves at the top of their list of priorities. Even airlines have to remind those with children that the air mask should go on the adult’s face first and then the child’s face next because if you don’t take care of yourself first how can you take care of anyone else? Julie is a wife, daughter, sister, aunt, human mother to Walter, friend and teacher besides having been an owner, worker and designer here at w&w. She put in long hours after her day job, sacrificing much and it is time for her to slow down and make herself the focus and design and craft just for fun and herself. 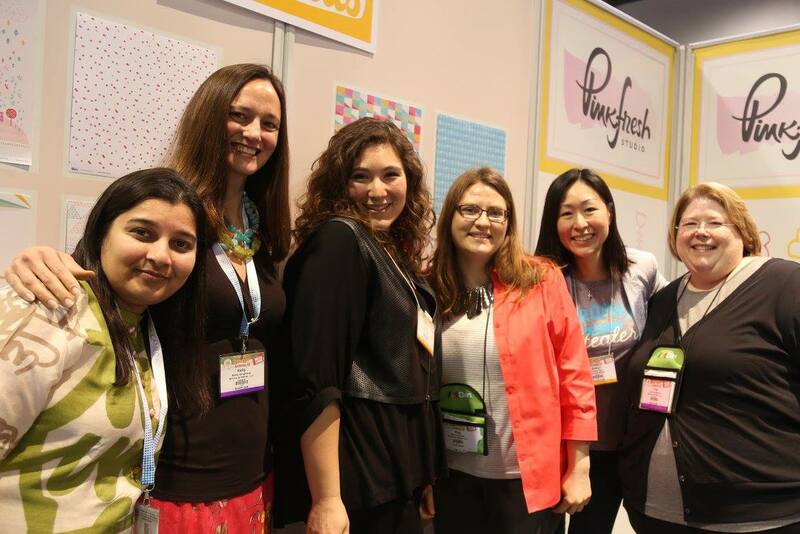 I really love this picture of Julie (far right) and I at our first CHA back in January of this year at the Pinkfresh Studio booth with Kinnari Zavari (of Pinkfresh Studio), Kelly Griglione (one of the w&w Talent), Julie Fei-Fan Balzer and Evelin Tee (the lovely designer we worked with to create Happiest of Holidays with Evelin T Designs and Merry & Bright with Evelin T Designs). Of course Julie would love to hear from you! Julie has a blog you can follow her at: starlight windsong; a facebook page: Julie Mogford Designs; along with an Instagram account: @juliemogford. You will want to follow her as she isn’t done crafting and designing. What does this mean for w&w? Julie + Walter will always be a part of the w&w family. If and when she feels she wants to join in, she will do so as she feels best fits into her life (and I wouldn’t have it any other way). The running of w&w will be carried on by me. It will be quite an adjustment to take it all on myself especially in the designing arena. My mind is brimming with ideas, I just need to learn the ins and outs of how to make them a reality! You should know that what w&w is what it is not only from Julie’s and my efforts, but also due to the support of Julie’s husband, Davis, and also that of my parents and sister. In the future my family will be even more instrumental as their enormous help enables me to do all I do. Family is everything and that is something Julie and I have always agreed upon wholeheartedly. Joni Andaya, one of our original members of the Talent, will be stepping down. Joni has been an incredible designer, wonderful member of our w&w creative family and an inspiration to us all. 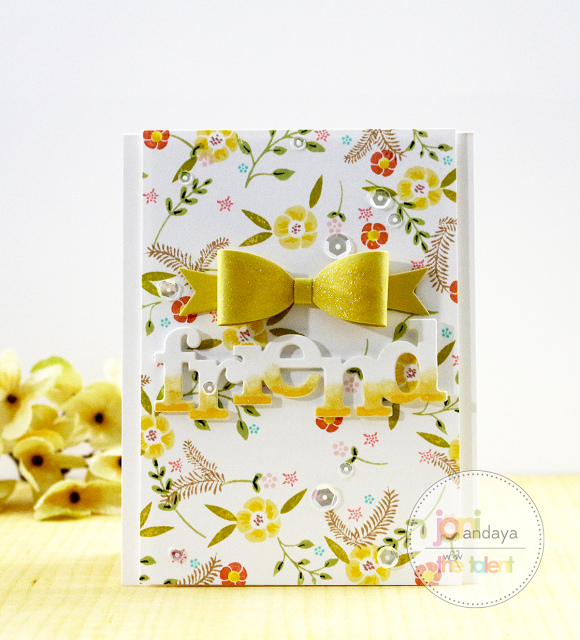 She was the first product designer we collaborated with to design a stamp set, In Bloom: Lola's Bouquet with Joni Andaya. Her creative and heart-stoppingly (a made up word that had to be used) gorgeous contributions will be missed but she will remain part of the w&w family as a free agent so we hope to see her here from time to time. We love you, Joni, and thank you for taking a chance on us and being an integral part of w&w's success! 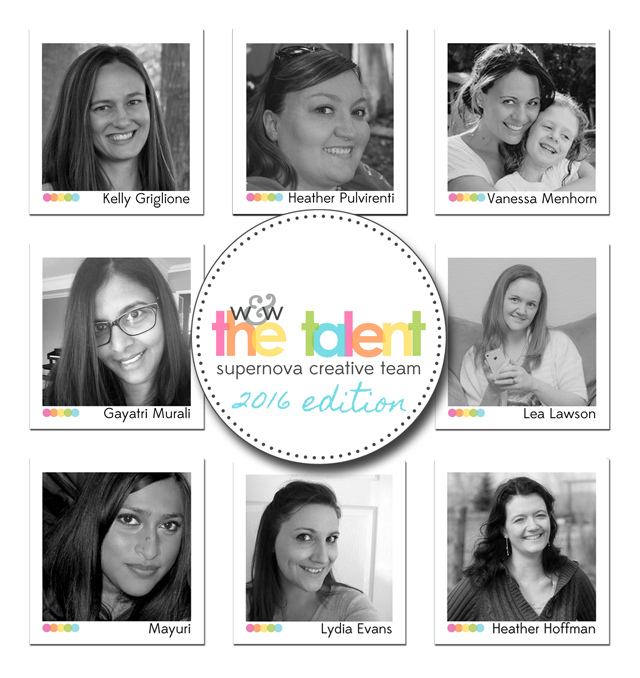 Gayatri, Heather P., Kelly, Lea, Mayuri and Vanessa are all staying on as part of the Talent. I feel very blessed as these sensational ladies make w&w wonderful and brighten my days by being themselves and with the beauty of their projects! I have invited Heather Hoffman and Lydia Evans to become part of the Talent in 2016 and happily they have both said yes! I am very excited as I adore these ladies and their work so much. I know they will be amazing additions to the Talent. Please give them a very warm w&w welcome! Winnie & Walter’s birthday month is January, but in light of all these changes (plus going to CHA next week to check out all the new goodness--hope to see you there.) we are going to have our month long birthday celebration in February…let’s call it a belated birthday bash. We will have month long challenges, plenty of giveaways, lots of inspiration and a “small” release to help celebrate. I hope you will stick around and see where w&w will go…it’s going to be quite an adventure! I wish you and your family a very blessed 2016 full of laughter, love, excellent health, relaxation and the joys of crafting. Shay, as sad as I am [and know you are] to see Julie go, you've got this! Together with this awesome group of talent? Nothing could stop you! Joni! I am so honored to have received your Lola set - you know the special place that name has in my heart .. I will miss you, so! I wish W&W a resurgence of Prosperity and success in this New Year and Everything wonder for both Julie and you Shay!! Here's to a fabulous New Year! Thank you, Dolly! Have an amazing 2016! Thank you so much, Lucy! I know you will love what is coming in 2016! Nothing stays the same. Though W&W's success was a collaboration, i know you're up to the challenge of moving forward on your own. You will miss those who've moved on but you have assembled an extraordinarily talented DT to carry the weight. Best of everything to both Julie and Joni. I know they'll make a success in whatever they choose to do. Thank you, Conil! Same to you! adore everything about W&W, from the fabulous stamp designs to the amazing inspiration and talent, and I can't wait to see what you have in store for us in 2016! I will miss Joni A LOT, her designs were always jaw dropping, but I'm happy to see that all of your other talented designers will be staying! Shay, thank you for the beautiful blog post! Good luck to Joni, and thank you for sharing your talent with us here at w&w! The 2016 Talent is going to create some phenomenal things this next year - I can barely wait to see. :) It is definitely an emotional time for both Shay and me and we wouldn't have gotten here without all of you. Thanks for making us feel so special and for creating beautiful projects with w&w products. Much love to you all! good luck Shay! I can't want to see what this new year brings! Now I must run because it's almost New Years eve here in my little corner of the world, and I look like one of the Google doodle's birds... sitting with my party hat and a clock, waiting for 12 pm. Such lovely words, Shay! It's always hard to say Goodbye :-( Sad to see Julie and Joni leaving but I'm so glad you carry on with W&W. I admire your courage and I wish you lots of luck and strength for this new adventure! Looking forward to see new products and inspiring projects from this incredibly talented DT! Wish you all a wonderful year 2016 filled with love, health and creativity! Hugs! Beautifully written. I think so many of us (probably all) agree whole heartedly with what you said -- sharing in the sadness of the changes and the hope and excitement of what your future and the future of W&W holds. No worries...I'm in it for the long-haul. I know I will continue to love this company and am totally prepared to support and encourage as you make the necessary adjustments. Many hugs and best wishes to you all! Phew! Big news! New Year, new chances. Thanks to Joni for her awesome work! I learned a lot! All the best to Julie and Joni!! and welcome Heather Hoffman and Lydia Evans! Shay! I'm sure you will do great! All the best to you too!! Wish you all a wonderful year 2016! And happy birthday Winnie & Walter!! Thank you Julie for all your amazing designs and creativity! Take care of yourself and I look forward to catching up still through FB :) Farewell Joni - you will be missed! Good Luck Shay with your endeavour to continue on your own - you have a brilliant design team! sorry about the changes but glad those that need to are taking care of themselves. I'll continue to be a fan and love your stuff! I absolutely adore both of you so much and you are so right that so many of us forget to put ourselves first, Julie I wish you the greatest personal success and I will still follow you on your personal blog and such! Thank you for all you've done for our community! Many hugs to Shay! Can't wait to see what new things are coming! Here's wishing each of you all the best for 2016 - above all happiness and health! Wishing you and Julie a very wonderful 2016! Looking forward to the new DT work and thankful for all the hard work and hours you and Julie have put in. All the best. Julie and Joni: you will be missed here at W&W, but we know where to find you! Wishing you a wonderful journey, wherever your paths take you next! Heather and Lydia, you are amazing designers and how fortunate *we* are that you've joining the ranks of one of the best DTs EVER! Shay, I have immense admiration for your strength in weathering these changes and challenges, and soldiering forward in keeping our much loved W&W going! Excited to see what dazzles and delights you have up your sleeve for 2016! Love W&W! Shay - it was wonderful meeting you at CHA. So glad we got a chance to talk about one of my favourite things - FOOD! lol. I didn't realize it at the time that you were starting this year solo - I KNOW you'll do a stellar job! Amazing stamp designs and gorgeous creations by the Team. I'm looking forward to getting to know you more and truly do wish Julie all the best!